A quick and easy side dish favorite. 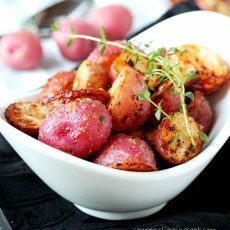 Potatoes are so handy to have on hand because they last a long time in the refrigerator and they’re perfect for easy last minute side dishes. 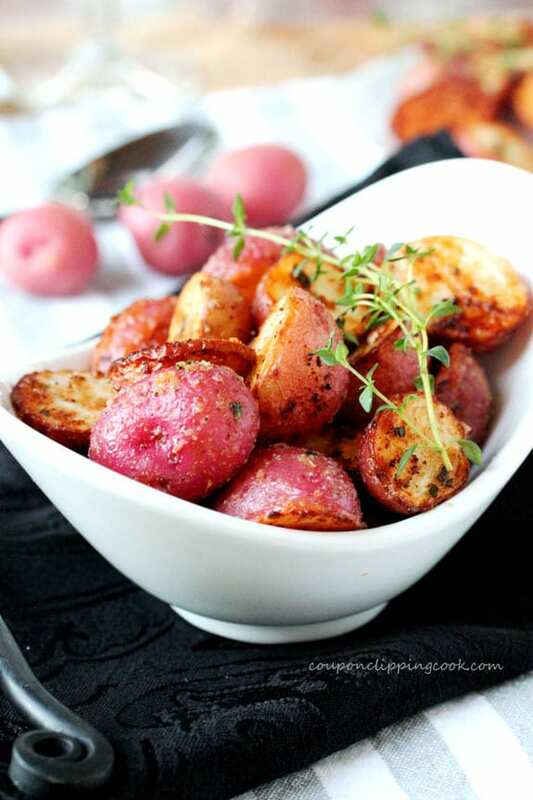 In this recipe baby round (or petite-size) red potatoes are used (a little smaller than the size of a golf ball and so darn cute). These very small potatoes are also called “new” potatoes because they’re harvested when they are young. 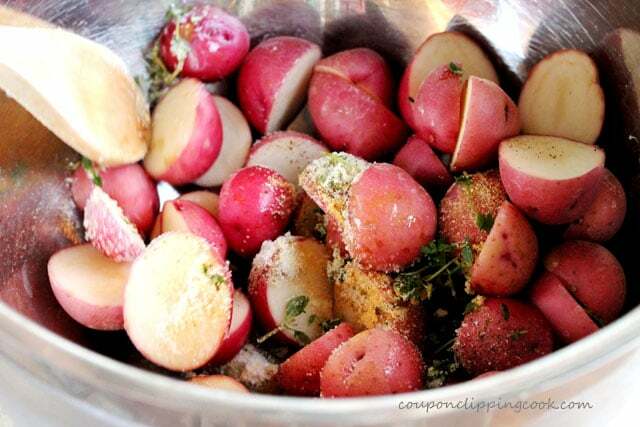 Their skin is thinner than a larger more mature potato, and new potatoes are ideal for roasting, steaming or boiling. 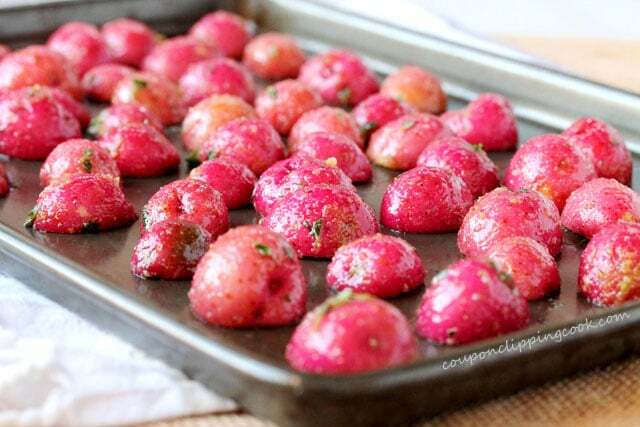 It’s great when these baby red potatoes are available in the market and especially nice when they’re on sale. 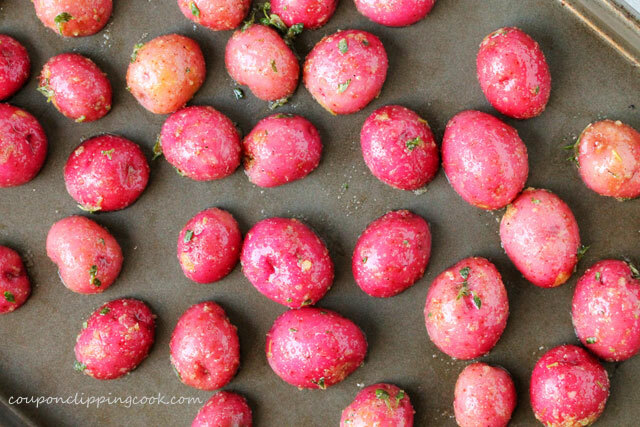 When making this recipe, if the baby red potatoes aren’t available or are too expensive to buy, check out the regular size red potatoes and pick out the smallest ones. 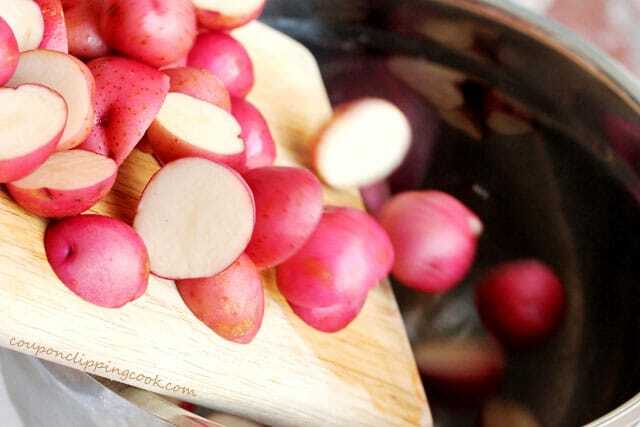 And instead of cutting them in half (like in this recipe for the baby potatoes), cut them in quarters or even smaller if using large size red potatoes. One of the things I love about this recipe is that everything goes into a bowl, gets mixed around and then put on a pan to cook in the oven. Super simple. For a flavor boost, this recipe has bacon drippings in it. Notice how I used the term “drippings” instead of “fat”? I guess it makes me feel better using bacon “drippings” in a recipe instead of using bacon “fat”. Boy am I ever in denial since they are the same thing. Anyway, if you prefer not to use bacon drippings, just substitute it with the same amount of olive oil. Although I used fresh thyme for garnish, another option is to use micro greens. 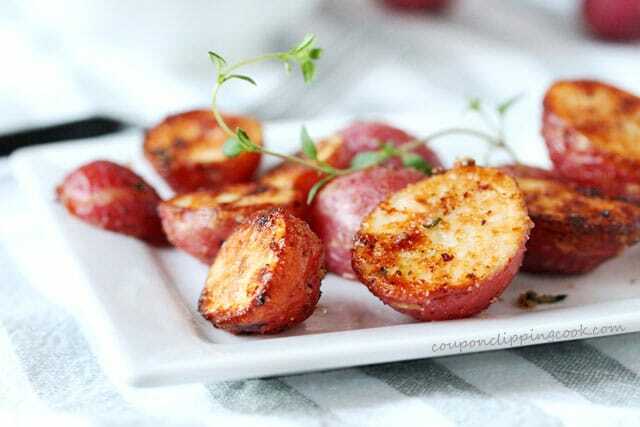 They are a beautiful garnish on top of roasted potatoes. 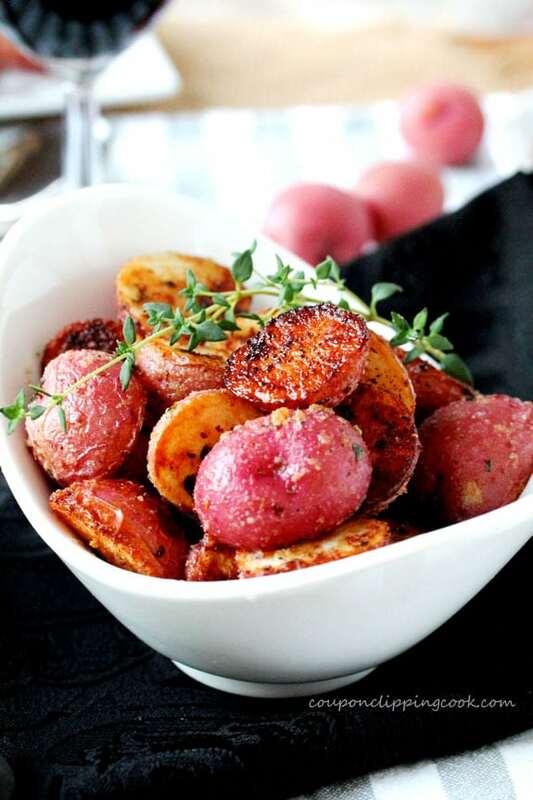 Recently at a wedding reception dinner I attended they served petite-size roasted potatoes topped with micro greens and small edible flower petals. The potatoes were so beautiful and perfect for the occasion. 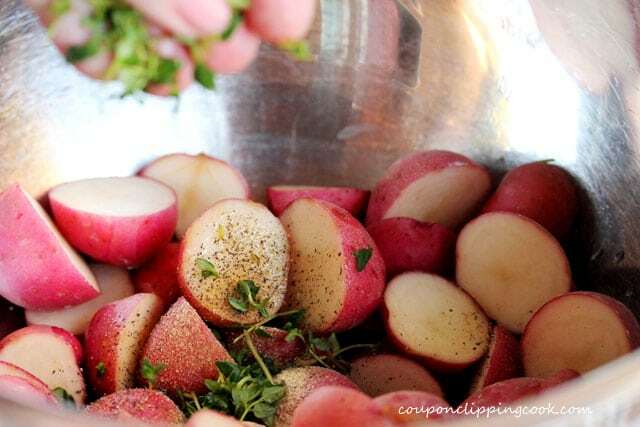 Cut the potatoes in half and add them to a large bowl. Next add the melted butter and bacon drippings. 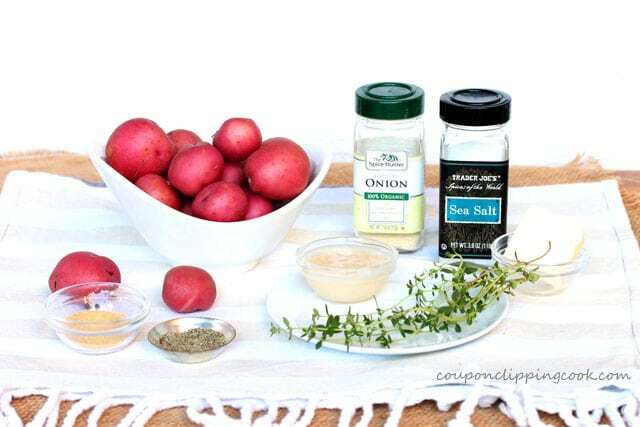 Mix together so that the potatoes are coated with all of the ingredients. lay each potato cut-side down. 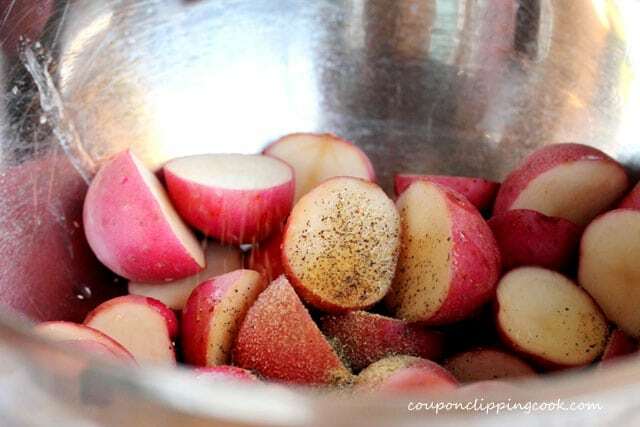 Bake in a preheated oven until the cut-side of the potato is a golden color (about 20 minutes). 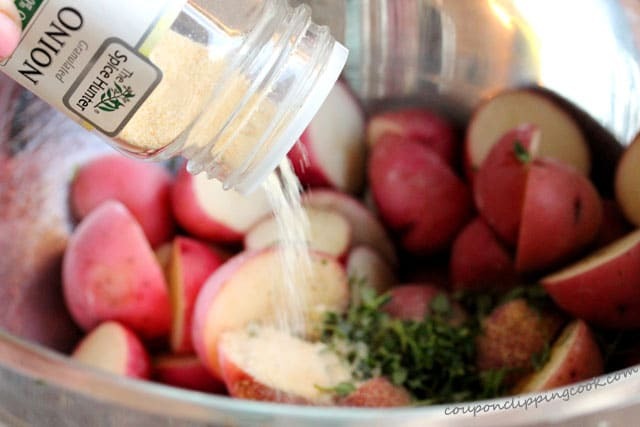 In a large bowl, add the potatoes, melted butter, bacon drippings, pepper, granulated garlic, thyme, onion powder, and salt. 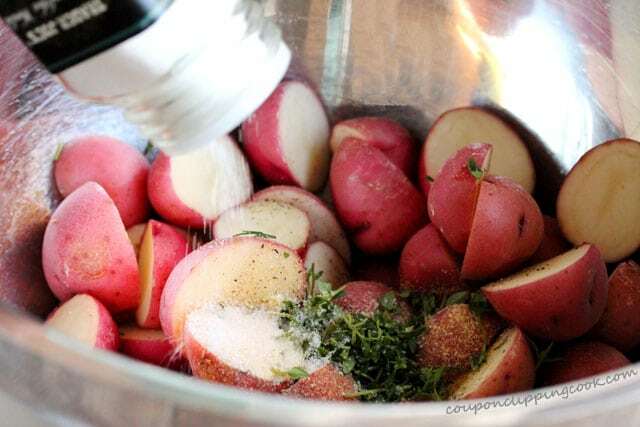 Mix together so that the potatoes are coated with all of the ingredients. 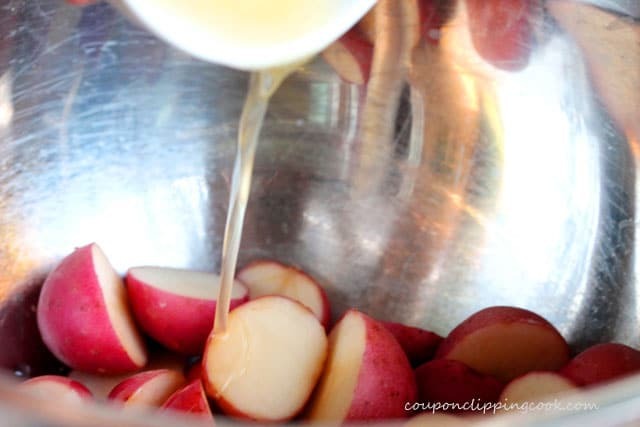 On a large cookie sheet, lay each potato cut-side down. Garnish with thyme and serve while hot. Hi Karen, thank you very much! And thank you for stopping by too! Have a nice weekend.